I’ve been using Blogger for six years. It’s seen me through angsty college musings, a public to-do list, the beginnings of a cooking blog, an ill-fated attempt at blogging in Russian, and an even iller-fated attempt at Rebekah auf Deutsch. Oh, and this here web log. When I started blogging, WordPress.com didn’t exist, and everyone I knew who wasn’t using Xanga (cringe) or LiveJournal (ditto) was on Blogger. But as I’ve continued, more and more of my friends have defected, falling head over heels for WP’s plugins and beautiful themes and shiny dashboards and seamless post tagging (Blogger was sadly late to the post categorization party) and integrated commenting (remember the days of Haloscan?). To which my response has always been: bah humbug. You see, I’m a bit of a Scrooge: I like Blogger. Specifically, I like the control it gives me over my template and the fact that I have this control absolutely free of charge. But in the meantime I’ve grown up and moved to the Big City and somehow become editor and technical director of one of the best graduate school blogs on international affairs in the country. And we use WordPress. 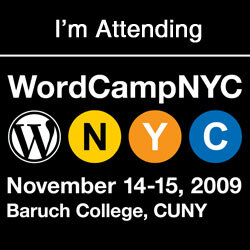 Which is why I’m spending November 13 and 14 at WordCamp NYC, surrounded by WordPress lovers and their shiny, shiny dashboards. If things go well (for the shiny dashboard people), I may even swaddle my precious Jackfruity baby in WordPress clothes.